Together with my friend, Steve Wesley, the son of a past Chief Cumshewa formed a partnership to promote First Nations tourism and share in our license to access Gwaii Haanas. I am proud and honored to have this strong local partnership. This is the land of the Haidas but we are all neighbors here and live as one community promoting our home. I love where I live, work and play and get huge pleasure guiding our guests and sharing what I've learned over the years about this amazing place. Having a Haida partner and Haida crew, your experience in Gwaii Haanas aboard Piraeus is enriched with the local knowledge on our tours. 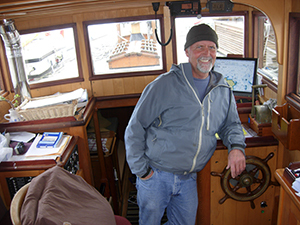 I have 45 years of experience working and playing on the BC Coast and Haida Gwaii. I obtained my Transport Canada Masters Certification in 1994 and launched my professional career on our ocean and over the years have had my areas of operation and distance offshore increased by Transport Canada as my nautical career has grown. It is our desire is to show the world a part of where we live and a memorable experience that will not be forgotten. The cultural history will intrigue, sadden and enlighten you as you consider the history of our Canadian governments over the years toward the Indigenous Peoples of our country but will also give hope to the future as you learn of the present day Haidas, Gwaii Haanas and the future of the Haida people and these beautiful islands. Captain and crew strive for excellence with our vessel and how we present ourselves and this place of wonder to you.